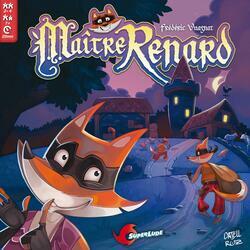 Master Renard, the famous goupil, wishes to take some holidays away from his domain of Grisbois. But before leaving he will choose a replacement among the most intrepid pilferers of the forest. Prove your worth by accomplishing the missions that will entrust you to the illustrious rogue and bringing back the biggest booty possible from the neighboring farm! The players embody clever little foxes that do their best to impress the Fox Master during nightly expeditions to nearby farms. Each turn, 3 new Missions cards are revealed to designate objects and animals to find. All players then place their fox mask in front of their eyes so they do not see anything. All at the same time, and with the help of one hand, they try to recognize groping pigs, dogs, cows, cheeses or hens, and recover those corresponding to their mission. As soon as a player thinks he has caught the 3 goals, he shouts "STOP" and ends the hunt. Each loot picked up earns 1 point (materialized by an egg token), but beware: each mistake makes one lose! Over the sleeves, Ruse tokens are added to the game: the Renardeaux bring 1 extra point, the Snakes can steal a loot from the bag of one of your opponents, while the Hammer keeps away these vile reptiles ! The first player to harvest 10 eggs won.